The island has been the home of Naval Air Station (NAS) Whidbey Island since 1942. Training takes place at Ault Field, north of Oak Harbor, and at Naval Outlying Landing Field (OLF), located about 5 miles from Camp Casey Conference Center. 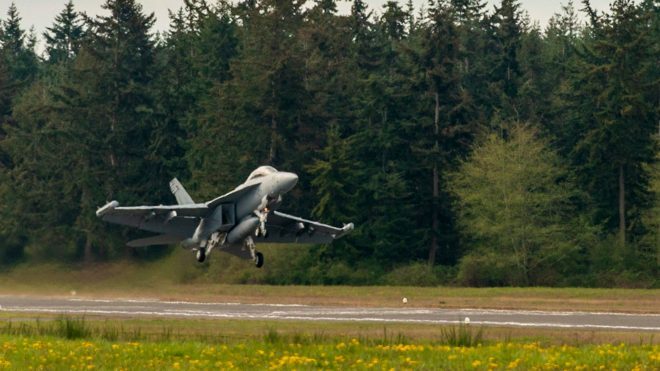 When you visit Whidbey Island, it’s possible you will see or hear jets training. In 1967, the Navy determined that OLF provides realistic training for aviators preparing to land jets on aircraft carriers. This is called Field Carrier Landing Practice (FCLP), a type of touch-and-go training that is crucial for pilots. Landing on an aircraft carrier at sea is one of the toughest things for a pilot to master. Pitch, airspeed, rate of descent, power – all have to be spot on, and all are constantly changing. Training must simulate what pilots will encounter, which is why some training takes place at night. The jets training at OLF are EA-18G Growlers. This is the Department of Defense’s only Electronic Attack (EA) aircraft, and Whidbey is the only place in the country where they train. Their mission is to monitor and control electronic frequencies and deny, degrade, or delay an adversary’s ability to use this spectrum to communicate and target American and allied forces. Flight training at OLF rarely happens on weekends, or on more than three consecutive nights. However, national defense requirements can impact training frequency. The current flight training schedule for Ault Field and OLF is posted at www.jetsonwhidbey.com.